When it comes to municipal water supplies there are frequent complaints about the quality of the water that comes out of the tap all across the country. Whether it is a foul odor, an excessive amount of chlorine or sediment in the water, there are frequent complaints about the water that comes out of the tap. The solution for these issues is to use a shower head filter that eliminates the contaminants and leaves the water sparkling clean and clear. There are many different kinds of shower filters on the market and we found a number of them online during our preparation for this article. 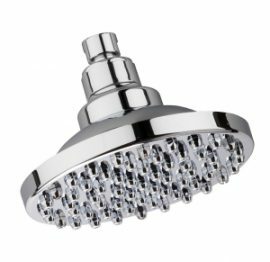 After all of our research for this article, we came up with the following list of the best shower head filter. We hope that all of our research and work helps you to be able to make an informed decision on which one of these shower head filters would be the best for you and your family. The WSH-C125 Filtered Shower Head is designed especially for those who live in areas with excessively high levels of scale and chlorine. It contains a filtering system that removes the scale, chlorine and even sulfur smells from the water as it passes through the internal filter media. No special plumbing is needed to install and it even comes with the Teflon tape for installation. The internal filter in the Culligan WSH-C125 is rated at 10,000 gallons or 6 months of use before it will need to be replaced. It features numerous anti-clog rubber nozzles in a unique pattern that produces a massaging effect on your skin. The filter will leave your family skin feeling clean and refreshed by preventing the harmful scale and chlorine to get through. 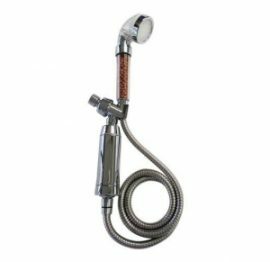 Culligan WSH-C125 Shower Head with Massage, is a high-quality filtering system from a company that has long been synonymous with clean water. The AquaBliss High Output Universal Shower Filter is a great looking inline water filter system that works with most shower heads. The shiny chrome finish is a good fit for any type of fixed or handheld shower systems. The replaceable filter media is designed to be easily accessible and only takes a few minutes to pop in a new filter. The key is inside the multistage filter that combines activated charcoal, calcium sulfite and KDF 55 materials that trap the contaminants like minerals, chlorine, heavy metals, bacteria and even pesticides in the water. The filter cartridge is rated at 10,000 to 12,000 gallons and then will need to be replaced. By removing all the impurities from the water your families skin will feel more refreshed and clean. 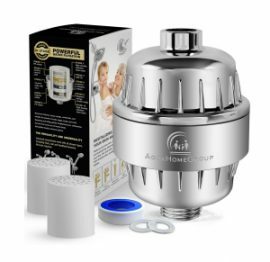 The AquaBliss Shower Filter would be a great option if you are looking for an inline water filter that will fit in with your existing showerhead. The Flowtec Filtered Handheld Showerhead is unique massaging showerhead that features a powerful three-part filtering system that helps to trap many different types of impurities commonly found in municipal water systems. The internal filter media does not need to ever be changed and will always work to keep the water that touches your skin clean and refreshing. The unique negative ionic effect combined with the triple filtering of the media help to virtually eliminate all of the impurities from your water in the shower. 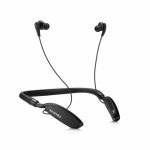 It combines tiny sphere shaped pieces of Red Germanium, Grey Tourmaline and White Medical Stones inside the handle that traps all of the contaminants. The low flow design of the showerhead is fixed at 1.66 gallons per minute which is perfect for water conservation. The Flowtec Filtered Handheld Showerhead is unique water filtering showerhead if you are looking for a filtering handheld showerhead for an existing system in your bathroom. 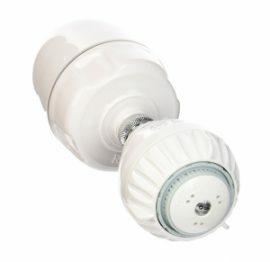 The Rainshow’r CQ-1000-MS Shower Filter is power filtering system that works in a unique way to remove virtually all of damaging effects of chlorine that is found in most municipal water supplies all across the country. The unique media materials combine to neutralize rather than trap the chlorine as a way to purify the water that comes out the shower head. The powerful water filtering system and showerhead combination are capable of filtering 25,000 gallons of water and it renders the chlorine in the water harmless by changing its characteristics. It uses a KDF-55 material which is a combination of copper and zinc to create a galvanic effect that changes the chlorine into a harmless zinc chloride. The attached shower head creates a massaging effect that helps to relax you while you shower. 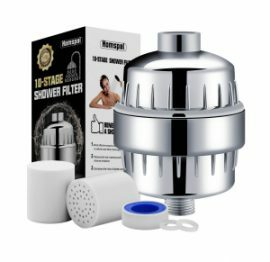 The Rainshow’r Shower Filter with Massaging Shower Head is one of the best of all of the shower head filters on our list and we would highly recommend it everyone looking for a filter for their shower. The 10-Stage Shower Filter from Captain Eco is a powerful way to remove the unhealthy impurities found in the typical municipal water supplies all across the country. The highly shiny chrome exterior of this inline water filter fits well with most types of fixed and handheld shower systems. The 10-stages of filter media combine to remove the majority of all of the contaminants from the water including heavy metals, chlorine, and most sediments. The filter media includes activated carbon (partially made from nutshells), KFD Process materials (copper and zinc), Biocera Ceramic Balls, Calcium Sulfite, polypropylene cotton, and Maifan Balls. Each of the filter cartridges is designed to filter up to 12,000 gallons of water or 6-8 months. 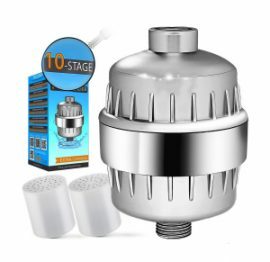 The Captain Eco 10-Stage Shower Filter is one of the best inline water filters on our list that would be a great choice for anyone to add to their existing showerhead. The 10-Stage Shower Water Filter from Homspal is great looking chrome-finished inline water filter. 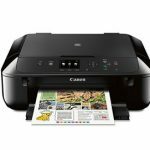 It is uniquely designed to fit in with most fixed or handheld systems without needing professional help to install it. The unique combination of filter media inside the replaceable cartridge ensures that it is able to remove the majority of all impurities from your home’s water. 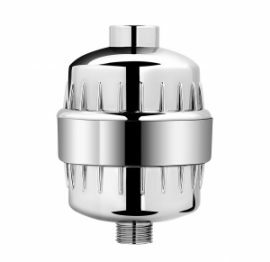 This great looking all chrome finished filter attaches inline to any existing fixed or handheld showerhead. The filter features a replaceable cartridge the contains multiple layers of powerful materials that help to remove chlorine, bacteria, heavy metals and sediment. Each cartridge is rated at 6-months or 10,000 gallons of water. The package includes Teflon tape for installation and two cartridges. The Homspal 10-Stage Shower Water Filter is the perfect the inline water filter that is compatible with most fixed or handheld showerheads. The REVIDALIZE Shower Head features a multi-prong approach to improving the quality of your skin and hair by filtering out the impurities from the water. The shower head system features an 8-layer inline water filter and it is coupled with a 2-layer filter inside the handheld showerhead. The handheld showerhead includes a pulsating LED light that provides a rejuvenating boost to the hair follicles on your head to help possibly reverse the effects of hair loss. The multilayering of filter materials helps to remove harmful chlorine, traps suspended sediment and other impurities that help to do damage to your skin and hair. The filter cartridge is able to filter up to 10,000 gallons of water. 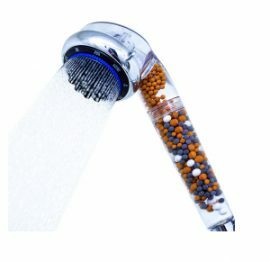 The REVIDALIZE Shower Head is a unique showerhead system that combines filtering with a replaceable filter cartridge and the permanent filtering in the handheld showerhead. 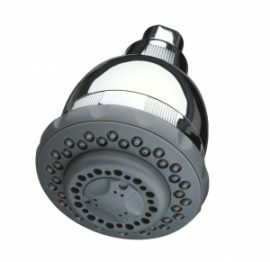 The RDSH-C115 RainDisc Filtered Showerhead is oversized showerhead that is designed to be fitted on any 2″ threaded fixed shower arm. The showerhead is fully chromed for a perpetual shiny look. It features dozens of tiny water nozzles in a unique spray pattern that produces an invigorating spray. Concealed inside is a powerful, replaceable filter cartridge that is capable of filtering up to 10,000 gallons of water. The filter removes the scale, chlorine and sulfur odor that is commonly found in the municipal and wells throughout the country. The filter also helps to prevent the buildup of harmful bacteria. The package includes a roll of Teflon tape that is used for self-installation that does not require professional help. The Culligan RDSH-C115 Showerhead, Chrome Finish is one of the simplest of all the filtered showerhead on our list. The 10-Stage Shower Water Filter is powerful inline water filter that is designed to work perfectly with either a fixed showerhead or can also be used with a handheld showerhead system. The filter includes two unique 10-layer filter cartridges that are able to eliminate virtually all of the impurities, chlorine, and sediment. The filtering the water in your shower will help remove the scale, chlorine and other impurities that can cause premature aging of the skin and even lead to hair loss. The multilayer cartridge is capable of filtering up to 10,000 gallons of water. The unique design of the inline filter housing means that it can be fitted to a wide range of different types of showerheads like; rainfall shower, handheld, overhead and other kinds. The Aqua Home Group 10-Stage Shower Water Filter is one of the most versatile of all of the filtered showerheads on our list. The introduction of vitamin C to the water helps to neutralize the Chlorine and Chloramines water so that they are rendered harmless. The inline filter contains a replaceable cartridge that is capable of filtering up to 5,000 liters of water before it will need to be replaced. The unique shape of the inline filter will not add too much to the length of the showerhead. 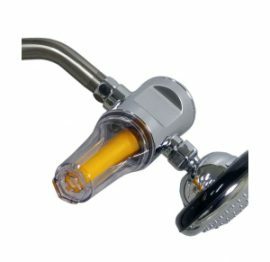 The Vitamin C Filter is one of the absolutely unique filtering systems that work with most pre-installed fixed or handheld showerhead system. 2017 TopReviewHut. All rights reserved.